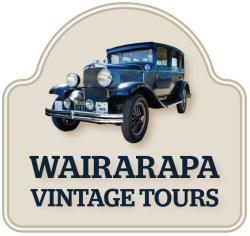 Our accredited driver will chauffeur you through the Martinborough township and surrounding country side visiting local vineyards and other places of interest in our beautiful vintage car manufactured in 1930. The tour will be tailored to suit your taste in wines and food and will be at a pace to ensure you enjoy the experience. Tours can include a lunch stop and visits to other points of interest in the area. 3 hours for up to 4 people $450. 7 hours (includes an hour stop for lunch) $900. Cars are available for weddings in the Wairarapa. Cars are available to take the wedding party to weddings and to go to other locations for photos before and after the wedding. The service is tailored to meet your individual requirements. Look at the Gallery to see the cars available. 2 hours $300 (minimum charge). Enjoy a drive from the Martinborough township and surrounding country side in a 1930 vintage car. With tours tailored to meet your needs, you could include a visit to Cape Palliser, Lake Ferry, Gladstone, Stone Henge Aotearoa and the Hood Aerodrome in Masterton. 7 hours (includes an hour stop for lunch) $900. Any admission charges additional. Spoil your loved one with a special experience on a birthday, anniversary, mother's day, father's day or any other special day. We can pick you up and take you to and from a special occasion so you arrive and leave in style. Alternatively, drive from Martinborough township to picnic or party elsewhere in the wonderful Wairarapa. 2 hours for up to 4 passengers $300 (minimum charge).